Hello! We hope you all have been having a safe and encouraging month despite the polar vortex and all the difficulties it’s brought for so many people. We’ve also had some sump pump adventures from the warm up last week, but all is well now ☺. Karl has been traveling a bit this month (so I’m extra thankful for safe travels with all the weather issues out there). His first trip was to meet with the rest of the Tech people in the Campus ministry. Keynote has been working under the Campus ministry more directly now for the last couple of years and so we have more regular participation in their development times. 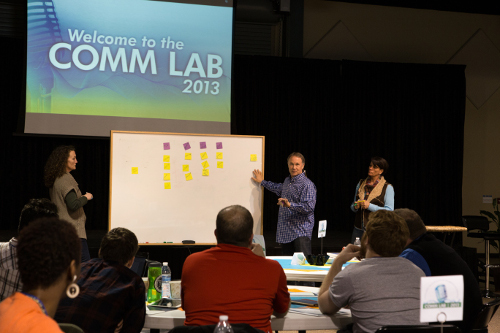 It’s encouraging for all the techs to get together and share ideas and strategies for using technology more effectively to serve our staff and reach those who need Jesus. And since many of them are young and new to their roles, Karl gets to bring his years of experience to the table to help them. The second trip was for all of our Keynote leaders to join in with the Campus leaders from around the US. The thing that seemed to encourage Karl the most was hearing from other leaders. They share their struggles and they share how God works, even using their weaknesses for His glory. God is so good. I must say that it encourages me to hear again that our leaders wish to be humble, real, and wish to follow Christ more than their own wishes. As for Keynote, our leaders are in the midst of praying through and planning how we should be structured and function in the future, so we would love prayer for wisdom and direction. Meanwhile, our Communication Training Team is preparing for a large Comm Lab in just a couple of weeks. This training is so helpful in that it takes a person from having a great testimony inside them to being able to share it with increasing effectiveness to those around them. When Karl and I first joined Keynote, we had this type of training and think it would benefit every single one of our Cru staff. So we’re excited to see the increased interest and opportunities to share this with them. For that matter, Comm Lab is open to the public, so anyone who wishes to may join in. More info is available at www.keynote.org (click on the Comm Lab button). Feel free to spread the word, too! This entry was posted in General, Prayer Letters on February 27, 2014 by Liesl.